Put some Tour de France under the tree. Have yourself a yellow Christmas. Which cyclist is going to wear the coveted Tour de France t-shirt? 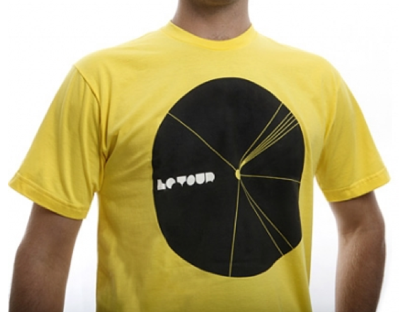 Before you max out your holiday credit card, swing by the ProjectLeTour website and pick up some cool tour wear, calendars and posters. The man behind ProjectLeTour is Brent Humphreys, a super talented Austin, Texas photographer who covered the 2007 Tour. His pictures capture the scenic beauty, the epic climbs and crazed fans — the silliness and lunacy of the Tour. A unique, behind-the-scenes perspective you’ve probably never seen before. Put the whole thing together and you have a shopping experience Amazon can’t match. Amazing Tour de France photos and distinctive cycling gifts. Tour legend says the t-shirt gives you wings. What cyclist doesn’t want to fly in the new year? « Team Saxo Bank’s new Tour weapon: the two-headed Haedo.